This article by David Reynolds, Research associate, Cardiff University; Ian Hall, Head of School of Earth & Ocean Sciences and Research Professor, Cardiff University, and James Scourse, Professor of Marine Geology, School of Ocean Sciences and Director of the Climate Change Consortium of Wales, Bangor University was originally published on The Conversation. Read the original article. Our research team has spent the past two decades examining the chemical composition of the longest-lived animal that doesn’t live in a colony known to science – the ocean quahog clam – to find out how the climate of the North Atlantic ocean has changed in relation to the atmosphere. This quahog can live for more than 500 years – and, as it does, it lays down growth rings in its shell. As with trees, the growth rings are at wider increments when conditions are more favourable and narrower when less so. By comparing these shell rings we were able to date each of them and find out what the temperature and salinity (or density) of the seawater was at the time of its growth. 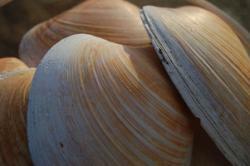 Any clams that lived at the same time had the same pattern of lines on their shells. So by comparing many of them together, we managed to extend the record backwards beyond the lifespan of just one individual, to around 1,000 years. Using this information, we have discovered how the ocean environment that these clams live in has changed. And we now have the first precisely dated, annually resolved, record of North Atlantic ocean variability covering the entire last millennium, allowing scientists to examine the timing of past changes in the marine environment relative to those in the atmosphere. Perhaps one of the most profound aspects of our research is the finding that human-driven climate change, resulting in an overall warming of surface air temperatures, has led to a reversal in the long-term natural coupling of the marine and atmospheric climate systems. Evidence from the shells shows that over the modern industrial period (AD 1800-2000) changes in marine climate lagged behind the atmosphere. Surface air temperatures responded much faster to human-induced climate changes than the North Atlantic did. Though we cannot speculate on what this will mean for the future, this new information will play an important role in reducing uncertainty in predictions of future climate variability. Though the shells of quahogs typically only grow up to 13cm in length, this finding from the study of the chemistry in their rings is astounding. Until now, there has been no direct evidence that variability in the North Atlantic during the past 1,000 years drove changes in the atmospheric climate, or if the oceans were merely responding to changes in the atmosphere. Our understanding of ocean variability timing in the North Atlantic, and the mechanisms behind it, were relatively poorly known until this study – and direct observations were limited to the 20th century. Growth lines on the shell of an ocean quahog. The black line represents 0.3mm. Looking further back in time, the oxygen isotopes record developed from the clam shells shows marked changes in the climate over the past 1,000 or so years. During the last millennium, volcanic eruptions, the power of the sun (solar irradiance) and human industrial activity all played a significant role in driving the conditions in the North Atlantic. In addition, our research found that the North Atlantic probably played an important role in the switch from the relatively warm conditions of the medieval climate anomaly (from about AD 1000 to 1400) into the cooler conditions of the “Little Ice Age” from about AD 1450 to 1850). 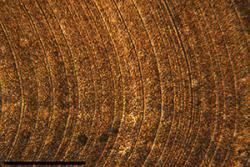 The most intriguing result from this period came from comparing the clam shell rings with ice cores and tree rings. While the shells allowed us to uncover marine variability, the ice and tree trunks have previously shown scientists what the atmospheric surface air temperature was like during different time periods in the northern hemisphere and Greenland. By comparing the shells with ice and trees, we found that over the pre-industrial portion of the last millennium (between the years 1000 and 1800) changes in marine climate preceded changes in northern hemisphere surface air temperatures. Between 1000 and 1800, changes in the North Atlantic – brought about by solar irradiance, gases being expelled into the atmosphere from volcanoes and changes in air circulation – were fed back into the atmosphere. This influenced the temperature of the atmosphere then, and means that the North Atlantic ocean was playing an active role in influencing atmospheric air temperatures. This continues to play a pivotal role in future climate variability, albeit now with a backdrop of long-term warming driven by greenhouse gases. This clam may indeed be small fry, but what we have learned about the ocean climate from quahog clam shells has drastically changed our view of the world’s atmosphere.